This book was such a natural choice for review. 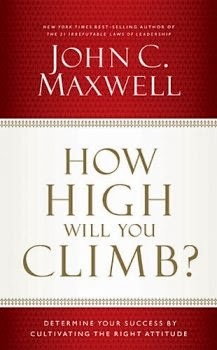 First, I'm a huge fan of John Maxwell, ever since reading his amazing "Talent is Never Enough." Second, not only is he a excellent educator in communication and leadership, but his teachings are all based on Biblical ideals and examples. The subtitle for the book "Determine Your Success By Cultivating The Right Attitude" might lead you to think this is simply a book for the upwardly mobile professional, but like the best in the self-help genre, this book takes a holistic view of success. How can our attitudes affect our work, our art, our families, and our spiritual lives? The book approaches the topic from lots of angles - where do we develop our attitudes, how can we thrive in difficult times, and how to rebuild your attitude from the ground up. This book is also full of useful tools. Each chapter has several Attitude Application sections to help you work through the subject at hand. At the back of the book is a Study Guide for either group discussion or more in-depth personal exploration. If you're a worship leader, songwriter, or concert artist, you should never underestimate the power of your attitude to influence your efforts to lead others and communicate the Gospel. This short but intense book would be a great addition to your bookshelf. Disclosure of Material Connection: I received this book free from the publisher through the BookSneeze®.com book review bloggers program. I was not required to write a positive review. The opinions I have expressed are my own. I am disclosing this in accordance with the Federal Trade Commission’s 16 CFR, Part 255 : “Guides Concerning the Use of Endorsements and Testimonials in Advertising." Worship Wednesdays - Choosing the CD Songs!